The lists like this could be possible, and they can further spread the word. My favorite works are the Valencia stuff from a famous street art group Escif, but also the one painted by Andreyante AO in Nizhny Novgorod, and the mural in Łódź created by a Polish street artist Barys. When going through a lot of fantastic pictures, I realized one thing. 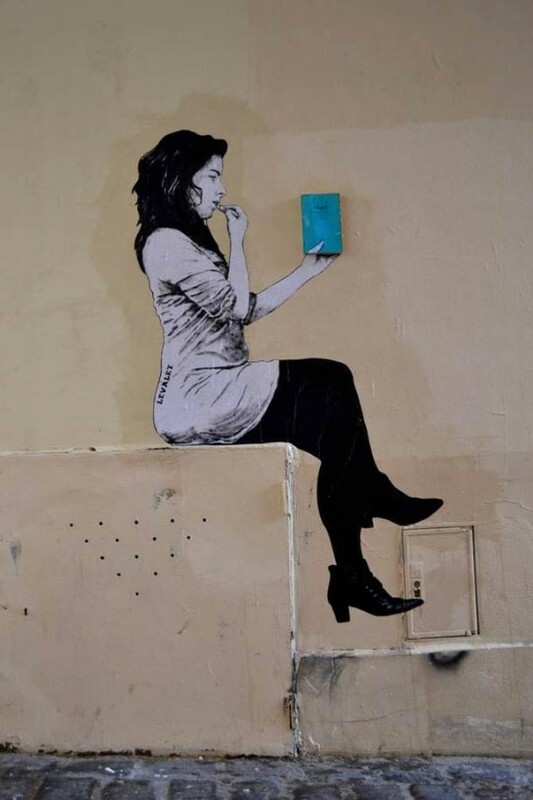 A lot of street art is coming to mobile devices – in a variety of screen wallpapers or designer cases. 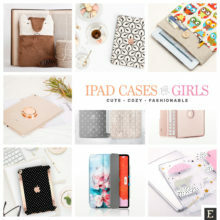 On the other side, almost no modern gadgets appeared on the streets so far, although they are becoming an important (if not overwhelming) part of life. 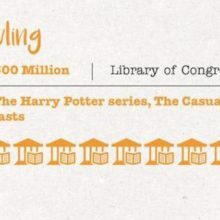 Books are our friends. 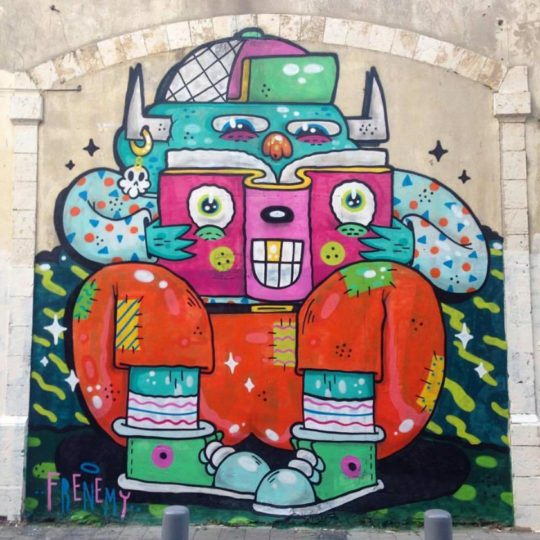 This awesome mural was painted by Frenemy (aka Kristopher Kotcher), an illustrator and street artist from Texas, and you can see it in Jaffa, Israel. ⇢ Credits and more info. Books in Austin. 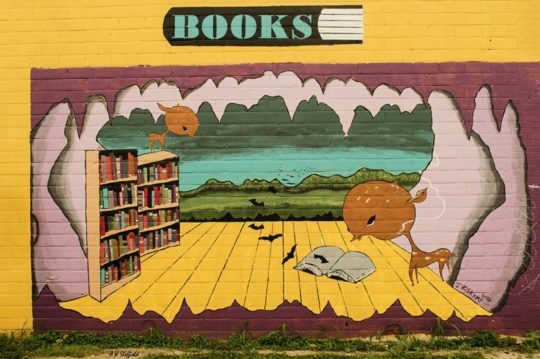 A mural on the side of South Congress Books bookstore in Austin, specializing in art, “quirkiana,” and vintage children’s books. ⇢ Credits and more info. 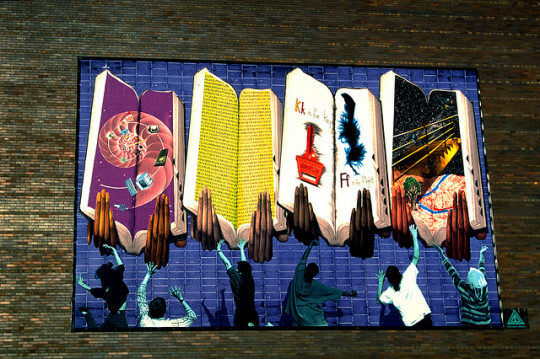 Book Discussion Scheme mural. 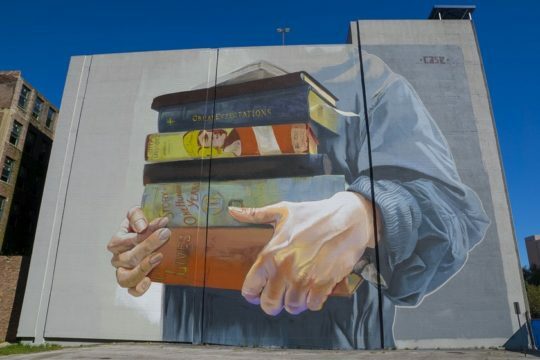 A mural on the street-front of the office of Book Discussion Scheme – the largest book discussion group in New Zealand. 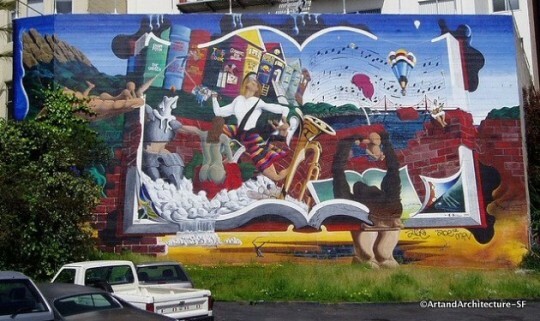 The office is located in Sydenham, Christchurch, and the mural was painted by well-known street artist Wongi Wilson. ⇢ Credits and more info. 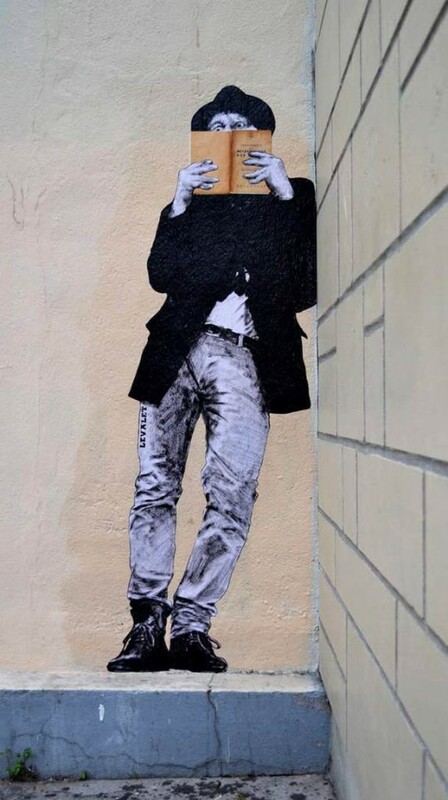 A boy reading a book. 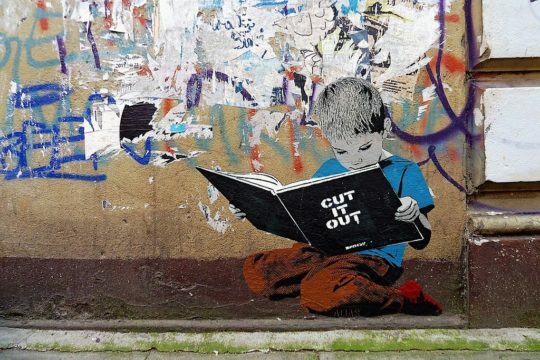 Favorite techniques of the Berlin-based street artist Alias are paste-ups and cut-outs. Thanks to that similar images can appear in public spaces more than once. 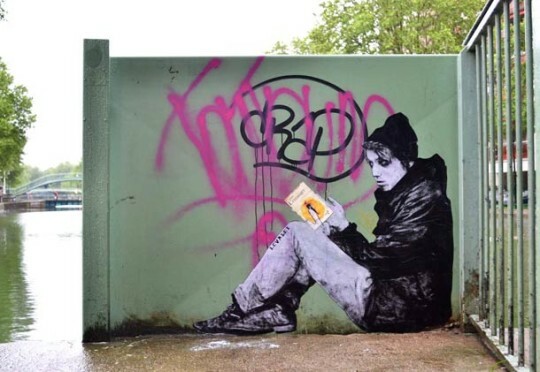 The artwork of the boy reading the book can be seen in several cities, including Hamburg, Berlin, and Istambul. ⇢ Credits and more info. A woman reading on a sofa. 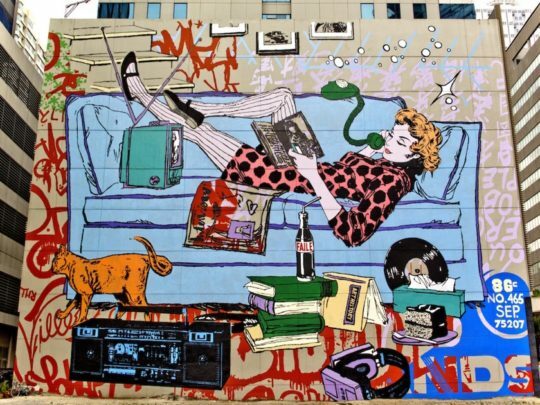 The mural was created by the street artist called Faile, for the artBGC ONE Festival. It’s located in Bonifacio Global City, a financial district of Manila, the capital of the Philippines. Real books. 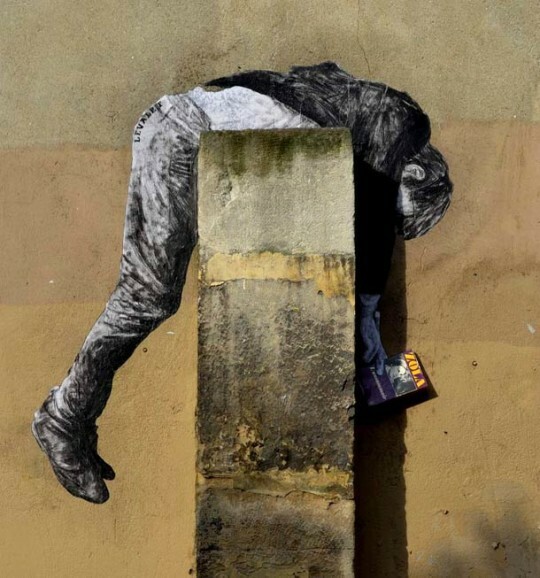 A French street artist Levalet creates collages on city walls across France. Some of his works show people reading. And what they are reading are actually real books. ⇢ Credits and more info. 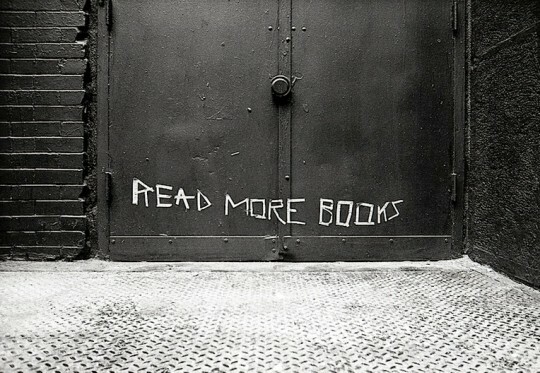 Book riot. 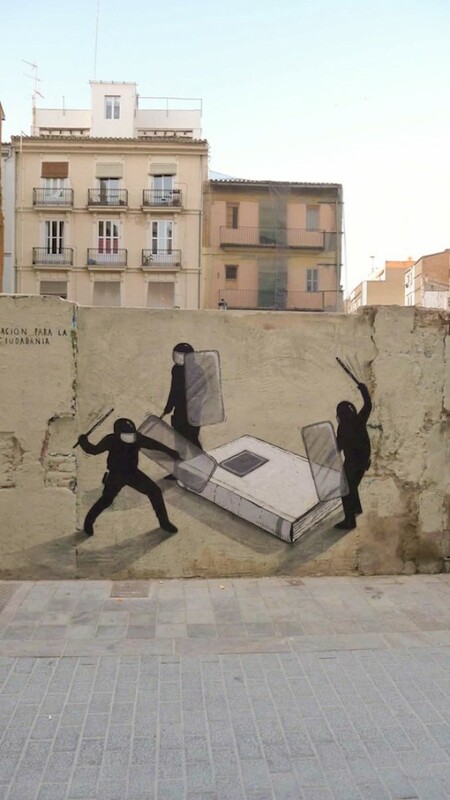 The painting is a part of a series of murals painted in Valencia, Spain, by a group of artists and performers from Escif. ⇢ Credits and more info. Literacy windows. The mural was created by Carolyn Speranza and Lisa Link with a help of five high school artists. 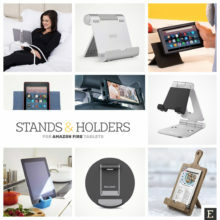 Please note, that the first book from left shows various learning tools. 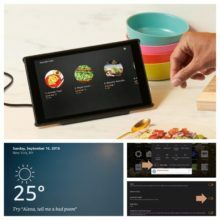 Except for books, there are also computers. 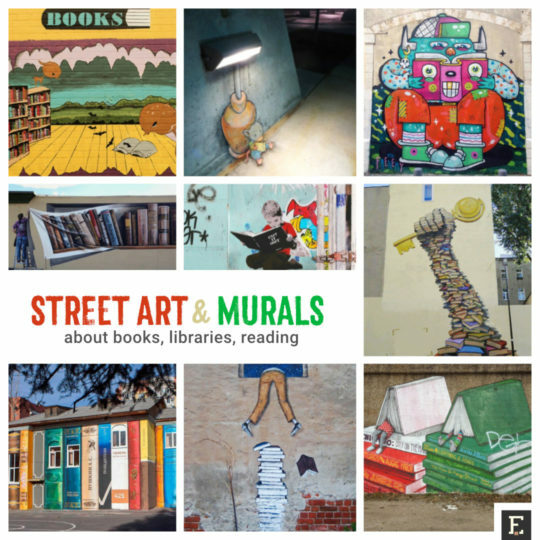 This is one of the first examples of digital books coming to street art. ⇢ Credits and more info. 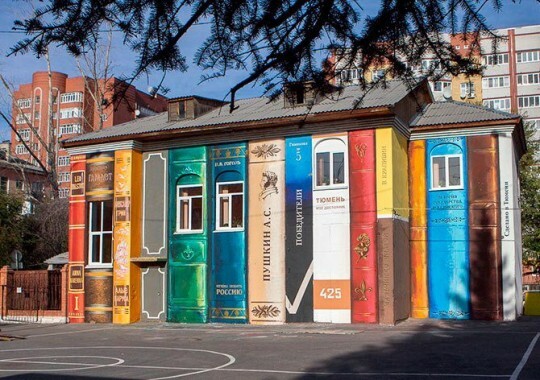 Literary mural. 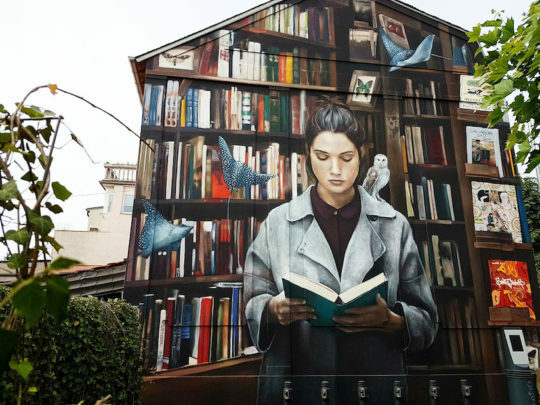 This outstanding mural was created by Jane Brewster and is located in Portland, Oregon, in the neighborhood of Hawthorne Boulevard Books and Powell’s Books bookstores. ⇢ Credits and more info. Reading punk. 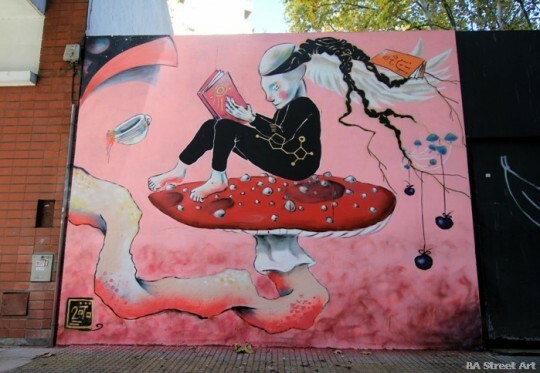 A part of a street art project by Buenos Aires street artist Patxi Mazzoni Alonso. The project’s idea is “to promote study, work, education and music and show the punks visually to people who have rejected them and don’t recognize who they are.” ⇢ More photos and info. 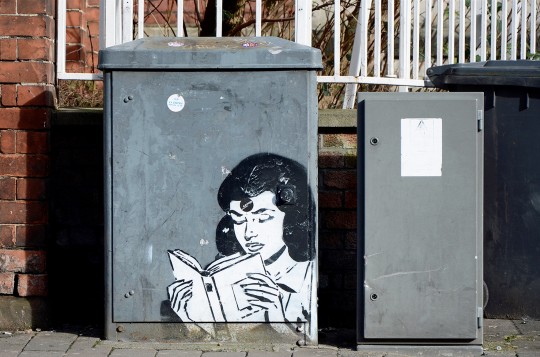 Girl reading. 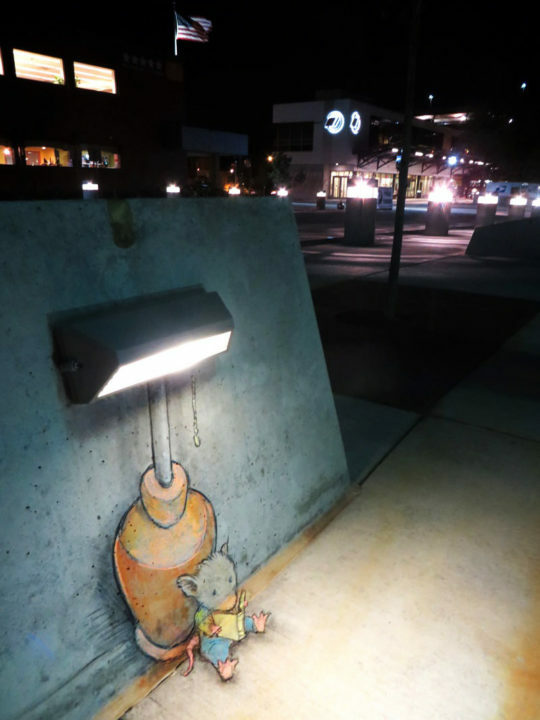 Street art in Gloucester. Found and pictured by Donglos Images. ⇢ Credits and more info. 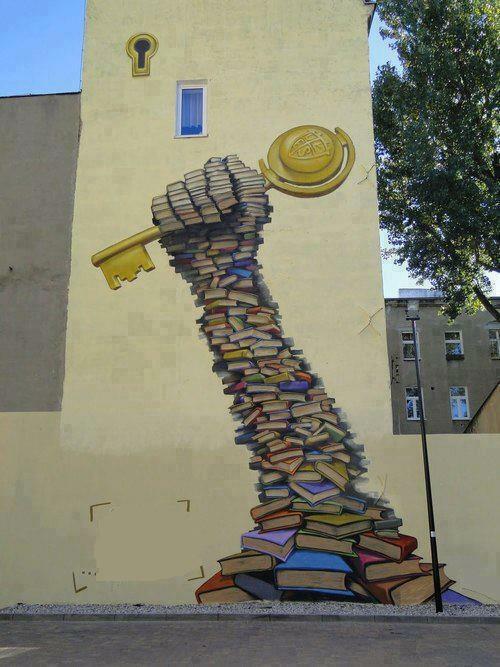 Books are the basis. 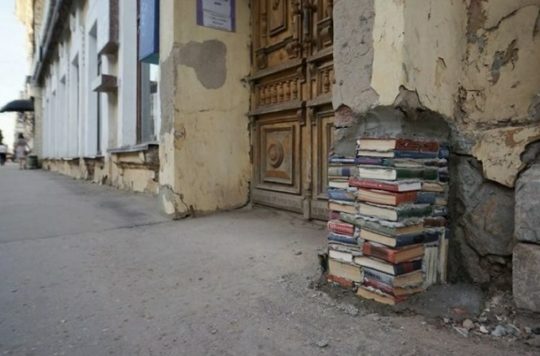 A smart street art spotted somewhere in Russia. 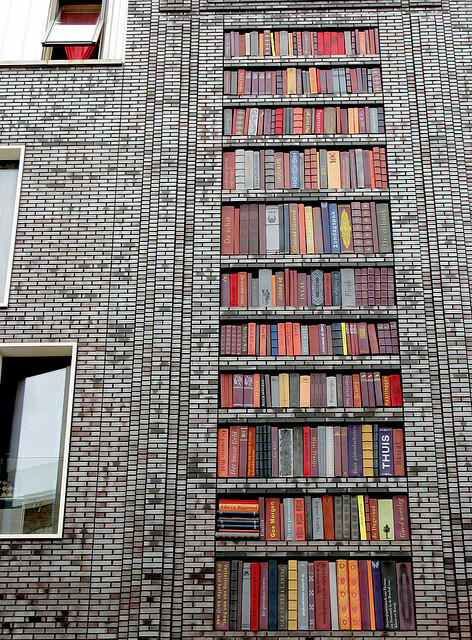 It doesn’t look like a painting, but real books walled in a column. ⇢ Credits and more info. Reading while growing roots. 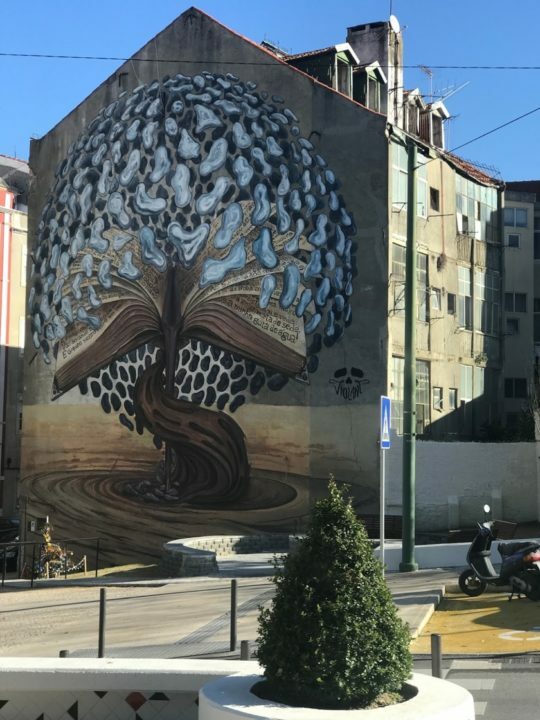 A surreal mural in Nuñez, painted by a Colombian artist Loto. “A pseudo human being is reading while growing roots.” ⇢ More info. 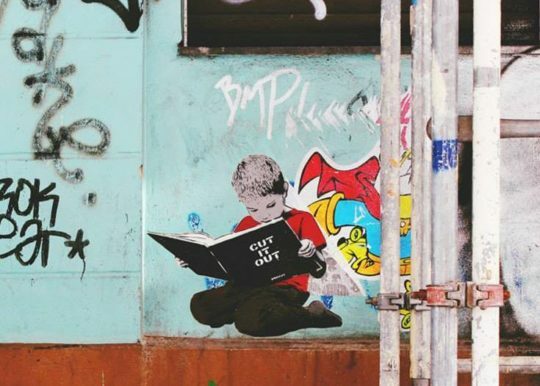 Kid reading. Mural on the side of the Trilok School on Waverly Avenue, Brooklyn. Created by a legendary Chile-based artist Nelson Rivas (Cekis). ⇢ Credits and more info. Reading: a Journey. 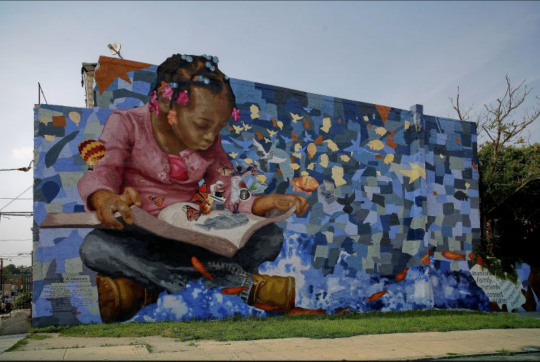 This huge mural was created by Donald Gensler and can be seen in Philadelphia. The mural is a part of The Mural Arts Program that has created more than 3,000 paintings representing important aspects of Philadelphia’s African American history. ⇢ Credits and more info. 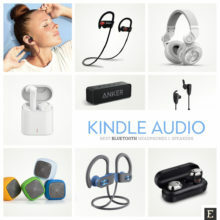 Joyous discoveries: a journey through books and music. The mural was painted by Keith Hollander at Market St. and Duboce Ave, in San Francisco. 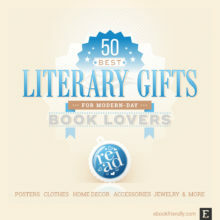 There are several books visible, including Gabriel Garcia Marquez’s 100 Years of Solitude, and Catcher in the Rye by J.D. Salinger. ⇢ Credits and more info. Read. Sticker and poster campaign that started in 2005. 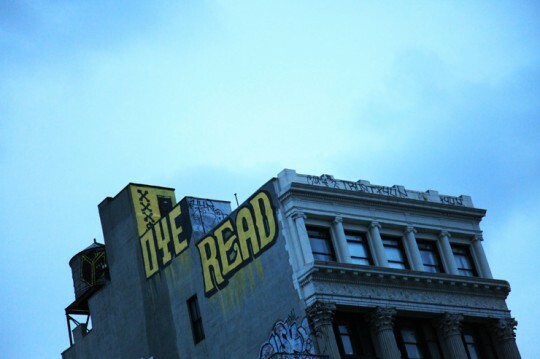 Created by Brooklyn-based artist and performer Jay Giroux. ⇢ Credits and more info. Pile of books. 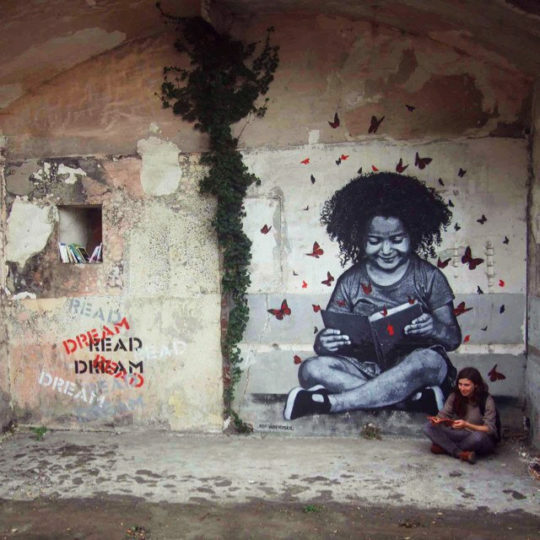 This amazing mural was created in Frankfurt by a Brazilian street artist Tinho (Walter Nomura). It shows two kids waiting on a pile of books. ⇢ Credits and more info. Oye read. 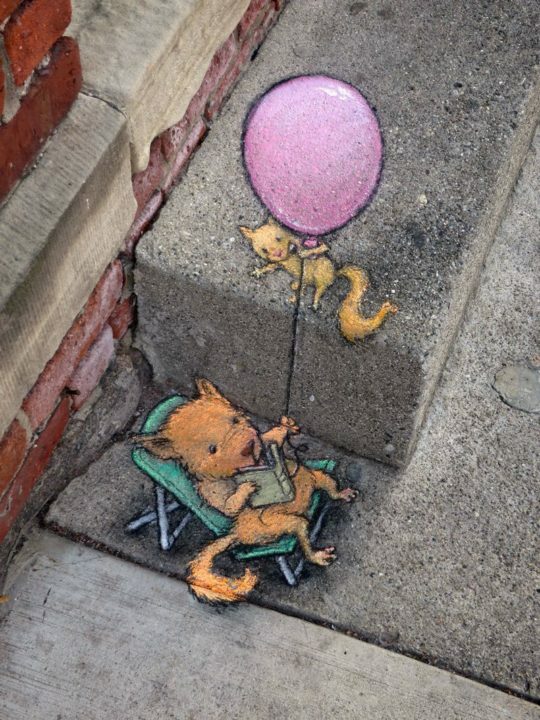 From Brooklyn Street Art resources. Artist unknown. Photo by Jaime Rojo. ⇢ More info. 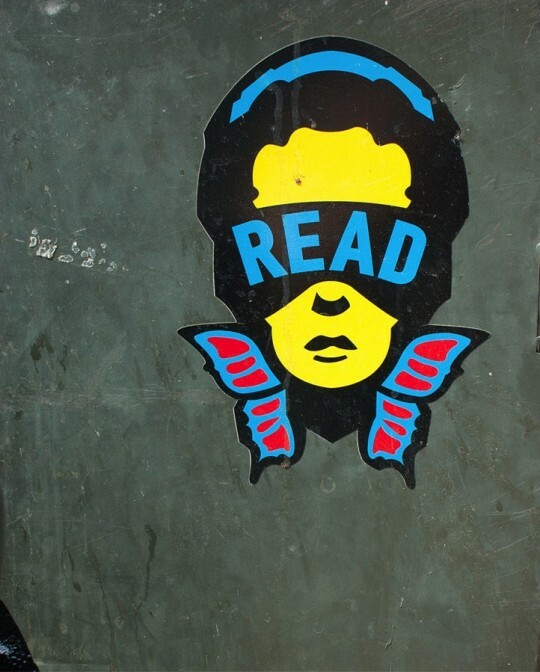 Read more books. A simple typographic art spotted and photographed by Red Boy. ⇢ More info. X-Times people chair – woman reading. A part of a street art performance by a German artist and performer Angie Hiesl. 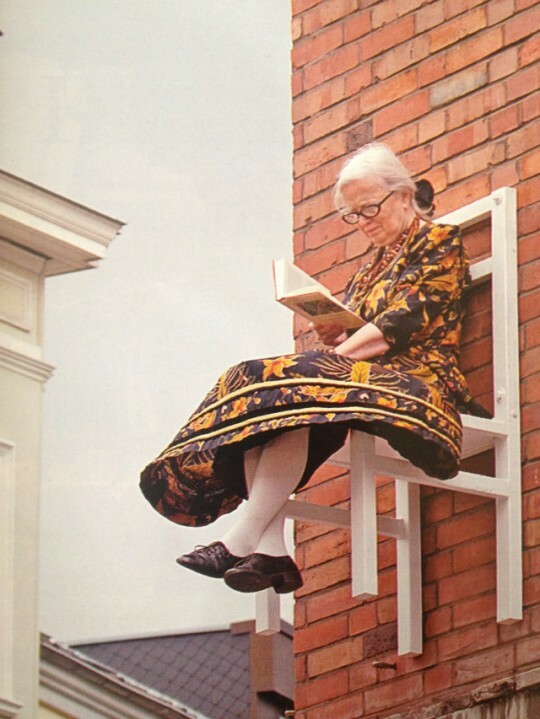 Elderly people sit on white chairs that are mounted on buildings at a height between three and seven meters. 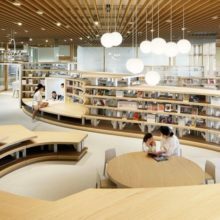 They perform rehearsed, everyday activities in a reserved manner: they read the paper, slice bread, fold clothes… ⇢ Credits and more info. 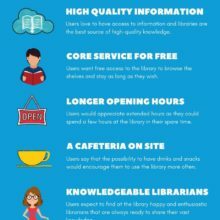 La bibliothèque. 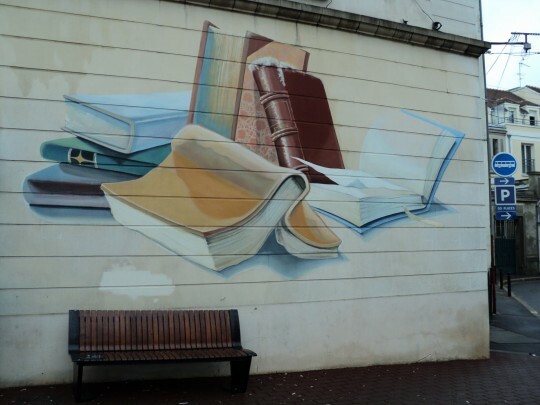 A small mural on a library building in small town near Fontainebleau, France. Pictured by Kelly Robic. ⇢ More info. Dr Seuss “Read” sculpture. 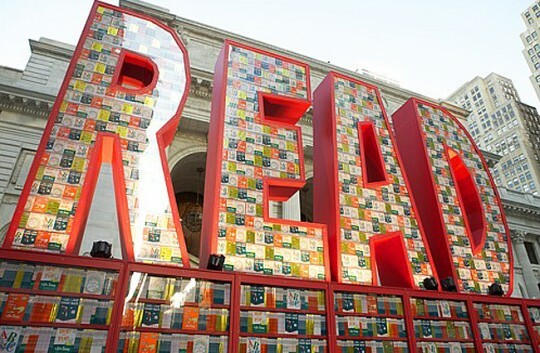 This amazing giant display was made of 25,000 Dr. Seuss books in front of the New York Public Library, between the library’s iconic lion statues. The sculpture was a collaboration between the National Education Association and Target Corporation and is a part of the Target’s plan to donate $1 billion to education-related programs by 2015. ⇢ More info and photos. Inside a bookshelf. 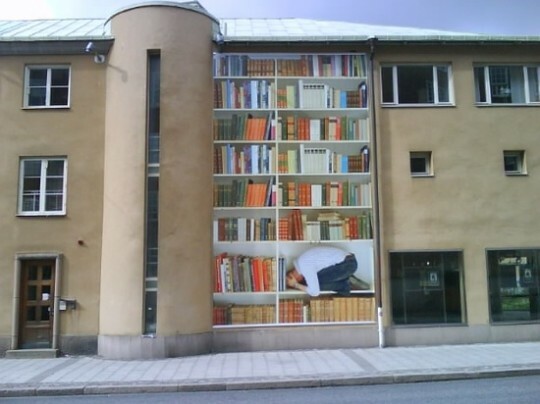 Mural by Susanna Hesselberg, in Örebro, Sweden. 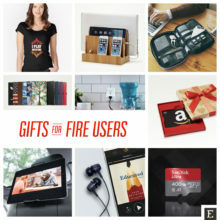 Credits, ⇢ Credits and more info. 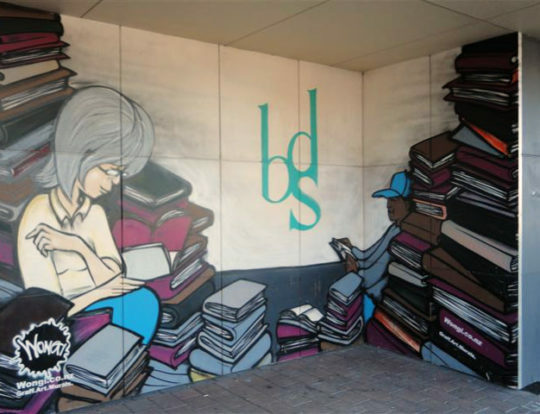 Bookstore mural. 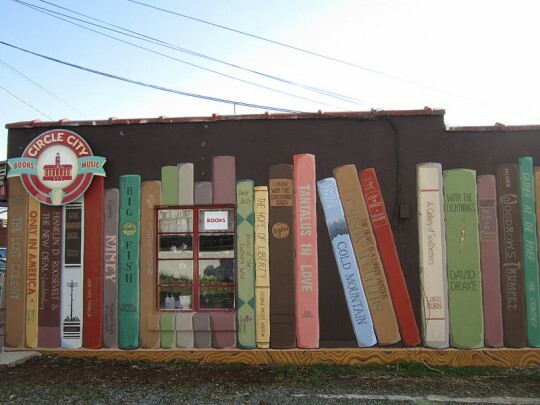 Created on a side wall of Circle City Books and Music in Pittsboro. ⇢ Photo credits. Larchmere mural. 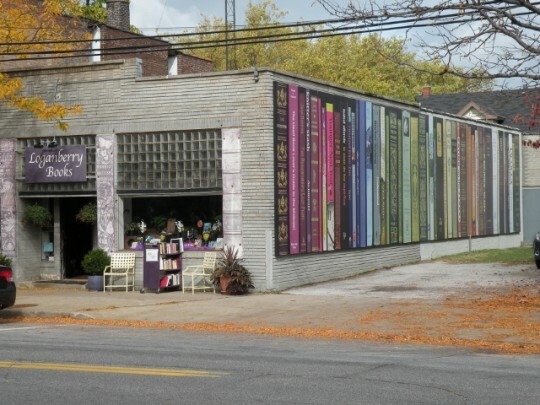 The mural graces the east wall of Loganberry Books bookstore, located in Shaker Heights, Ohio. 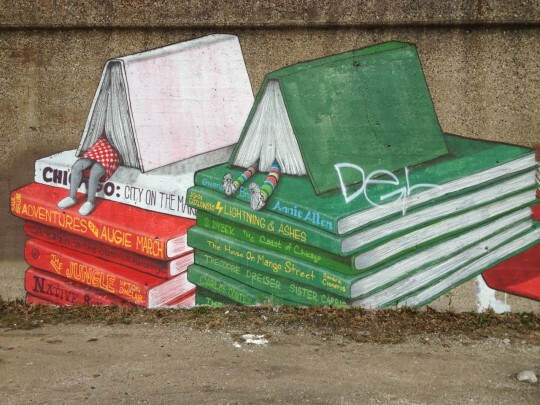 Created by artist Gene Epstein, the painting reflects the neighborhood’s people and history. ⇢ More info. La bibliotèque de la cité. 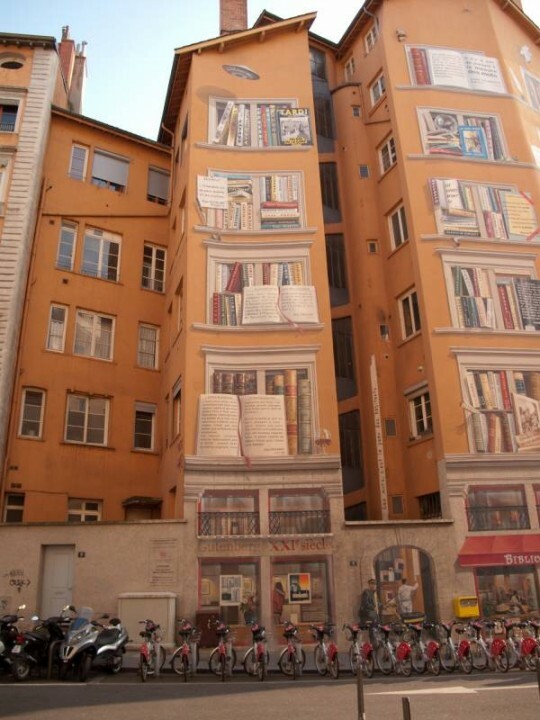 A beautiful fresco-style mural on the façade of the Lyon Municipal Library, France. ⇢ More info. Heart, culture and pedagogy. 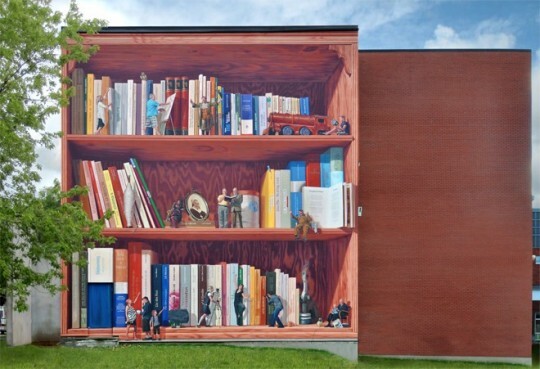 An amazing mural located in the College of the Sacred Heart of Sherbrooke, Quebec, Canada, on a wall of Éva-Senécal library. 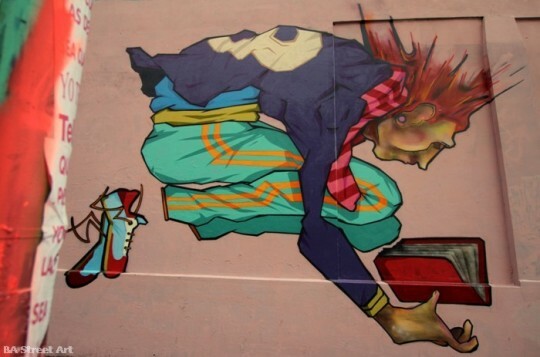 Created by artists from M.U.R.I.R.S. and influenced by master painters of trompe-l’œil, it is a metaphor of the local literary universe, with more than 100 authors represented. ⇢ Credits and more info. 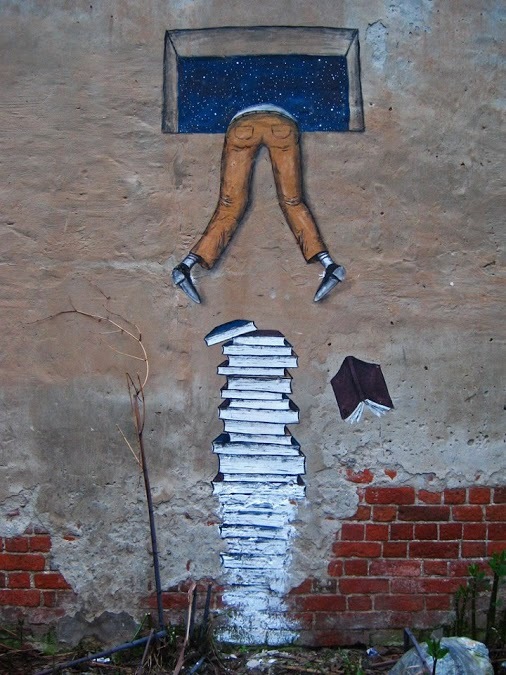 Flying books. Jazz mural by artist Bill Weber on Jackson Square, San Francisco. 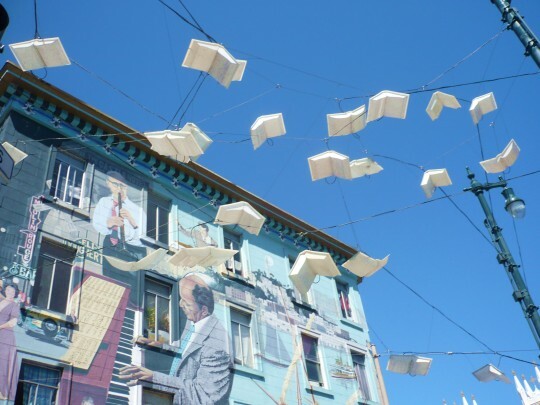 Flying books in front are Brian Goggin’s “Language of the Birds” installation. ⇢ More info. 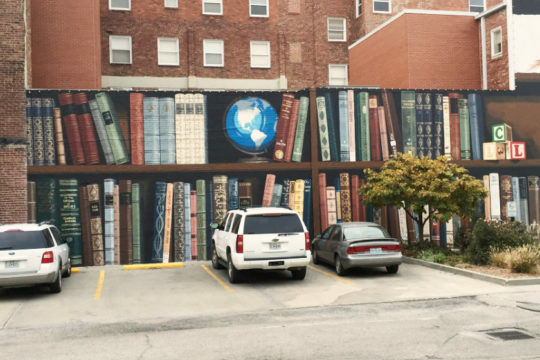 Library mural. 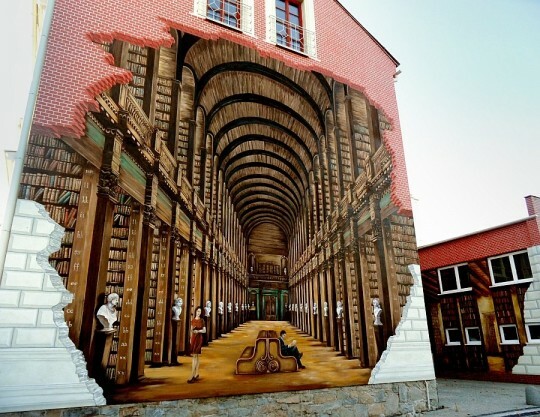 Created on seven walls of Ustroń Public Library, Poland, and taking over 500 square meters, the mural shows the interiors of the Trinity College Library in Dublin. ⇢ Credits and more info. 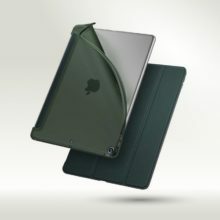 Open book. 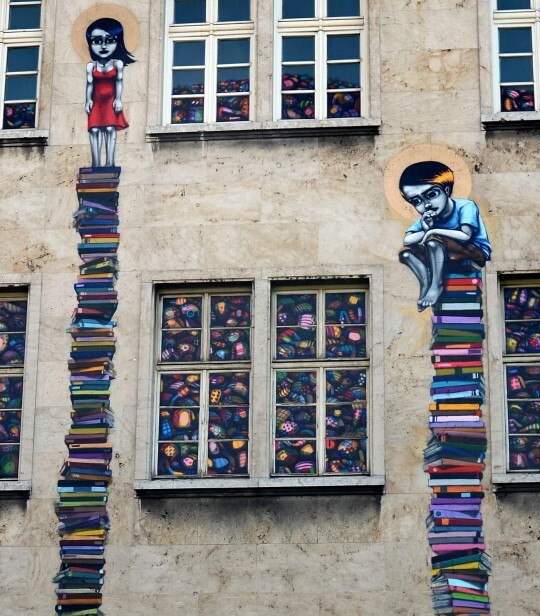 Bookish street art on a building located at Natália Correia Street in Lisbon, Portugal. ⇢ Photo credits. Bookshelf door. 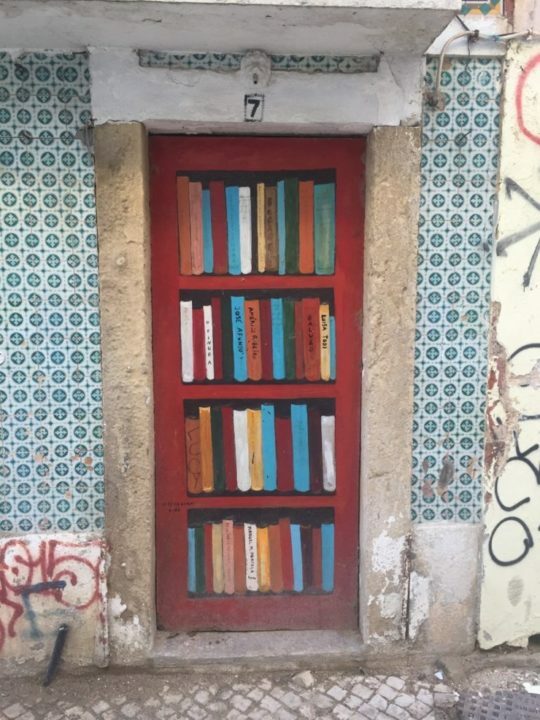 A bricked door in Setúbal, Portugal, was painted to look like a bookshelf. ⇢ Credits and more info. 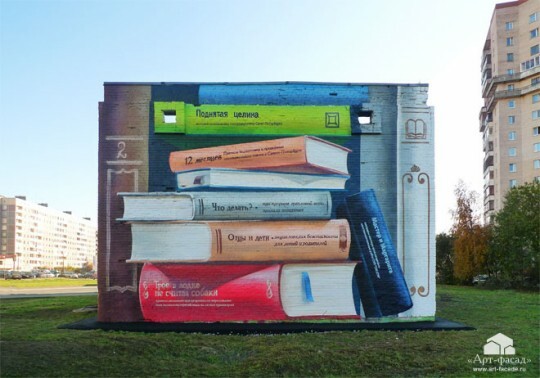 Giant bookshelf mural. 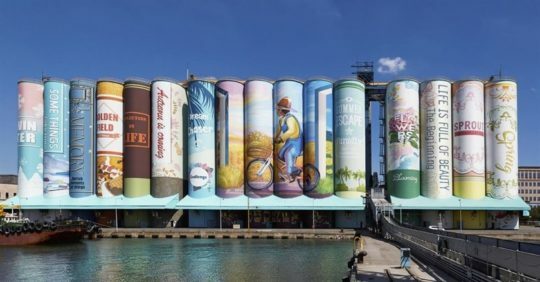 The mural was painted on a grain silo in Incheon port, South Korea. The painting measures 23,689 square meters. In September 2018 it was recognized by the Guinness World Records as the largest outdoor mural. Dublin Digital Classics. 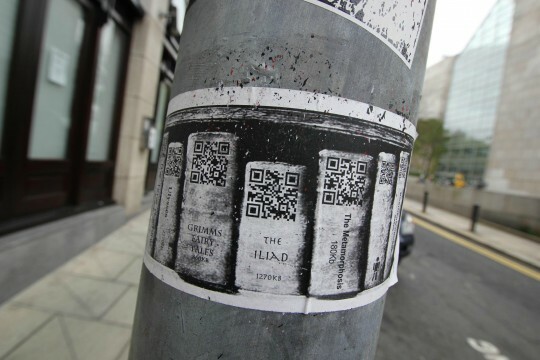 A part of a street campaign by Dublin City Council to get the young generation interested in reading. ⇢ More info. You can get more lists like this one. 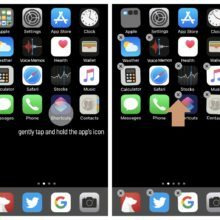 Get free updates either by RSS or email. 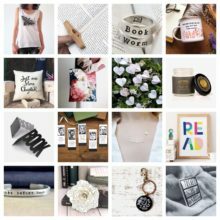 Let’s also connect on Facebook, Twitter, and Pinterest.